This was too good not to share here! Please enjoy this look at my job, which is so much more than a job; it is a lifestyle. This definition is a very brief synopsis of what we do. To narrow it down I will elaborate. Western Pleasure Guest Ranch offers all-inclusive guest ranch vacation packages from June 1 to September 30. During that time folks stay for 3-6 nights to experience ranch life. Lodging, food, horseback riding, other ranch activities, beer, and wine are all part of this all-inclusive package. From October 1 to May 31 we have a more eclectic mixture of offerings such as horseback riding, retreats, dinner parties, sleigh rides, B&B stays, cabin rentals, nordic skiing and more. To know “who we are” requires a bit more explanation. We are first and foremost a family. 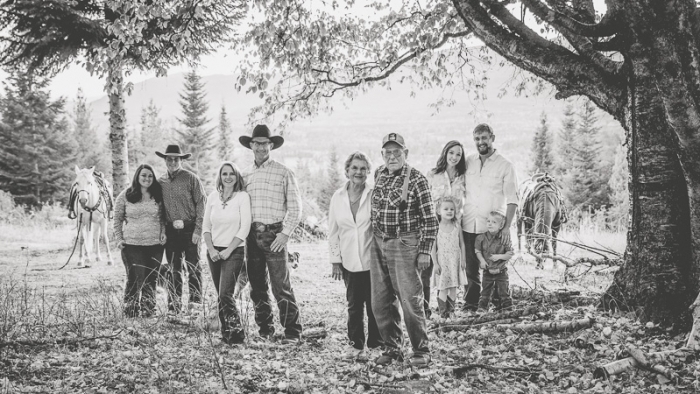 Roley and Janice Schoonover, together with their children, their children’s spouses and their grandchildren, own and operate Western Pleasure Guest Ranch. But the family history doesn’t begin here. In August of 1918, as WWI was coming to a close, Isaac Bonnie traveled by train to Sandpoint, Idaho from Burlington, Colorado to find and purchase land on which his family could start a new life. Isaac would soon bring his whole family to begin the work of building their homestead, later known as Bonnie Hole. They crafted a living out of the wild elements of the North Idaho mountains in the Gold Creek drainage. The Bonnie family survived off the land and the timber industry that was the driving force behind the population of this area of North Idaho in the early 1900s. In 1940, Riley Wood also chose to move his family from Colorado, chasing his dream of a cattle ranch in the mountains of Idaho. The Wood V-X ranch was born and continues to this day. Riley’s second son, Jim Wood, and Isaac Bonnie’s Granddaughter, Virginia Hoffine, were married January 1, 1948, uniting two families and one dream. Jim and Virginia raised their five children on the ranch, expanding their cattle operation to the lower ranch off of Highway 95. In 1991, Jim and Virginia’s youngest child, Janice, and her husband Roley began the work of growing a guest ranch. One hundred years after Isaac Bonnie first stepped off the train in Sandpoint, Idaho, guests at Western Pleasure Guest Ranch walk the footsteps of these pioneers. With a sincere appreciation for this countryside, the ranch has evolved to support the land and the seven generations of family who are so deeply rooted in it. In addition to the people we have been blessed to call our genetic family, the ranch is an adoptive family. The employees who work at Western Pleasure Guest Ranch are quickly adopted into that ranch family. At the end of the day, and sometimes in the middle, we stop and talk about life, family, and friends. We check in on each other, help each other and love each other. We are more than just co-workers; we are a family. We laugh and cry for and with each other. We are brothers, sisters, mothers, fathers, and friends. This family environment is why our 14 employees have worked here for a combined 104 years (and three of them aren’t even old enough to vote yet). We are an authentic ranch. In our culture today, we are quick to spot anything that is fake. Today’s traveler wants to experience in the country or culture they are visiting. They want to be immersed in something that is real. You can read more about authentic travel in my blog post, “Authentic Travel.” So, why is Western Pleasure Guest Ranch authentic? First, our 100 years of western heritage here on this same piece of land, in the foothills of the Cabinet Mountains on the Gold Creek drainage bear witness to our authentic roots. We manage the ranch so that the timber, wildlife, and grazing land remain healthy for the enjoyment of our family and guests and out of respect for God’s green earth. Second, our ranch is authentic because of the people who live and work here. With roots going back seven generations our passion for this place is self-evident. Our employees are true north Idaho locals who love where they live and sharing it with others in what they do. You won’t have to look very far to find a true local with a wealth of authentic, insider information here. We are not a ranch facade with a corporate engine. We are not, nor have we ever been, a brothel. So, what is Western Pleasure Guest Ranch? We are a place to escape from the modern busy lifestyle. A place to discover the adventure of the outdoors, the fresh air of the mountains, the freedom that only a day spent in the saddle can bring, and the comradery of ranch life. In short, we are a family who has a passion for sharing the heritage, horsemanship, and heart of the true West.